TEHRAN, Iran (CNN) -- President Mahmoud Ahmadinejad further fueled the unprecedented drama in Iranian politics ahead of Friday's national elections, giving a fiery response Wednesday to harsh criticism from one of the country's top politicians and other critics. 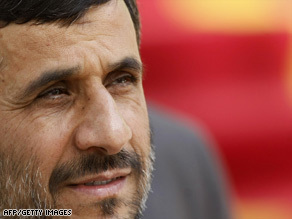 Mahmoud Ahmadinejad, who came to power in 2005, is seeking a second term in office. "They created an atmosphere in this country to make people think as though nothing was done," Ahmadinejad said of his critics in a televised address. "I am going to say, 'You lie, you lie.'" "Our work is in front of people's eyes," the president added, ticking off a lengthy list of accomplishments he says were made during his administration. Ahmadinejad has publicly engaged in a heated back-and-forth with former President Akbar Hashemi Rafsanjani, who accused the current president of "lies and distortions." Responding to the president's verbal attacks during a presidential debate last week, Rafsanjani said Ahmadinejad's "baseless and irresponsible" statements brought back "bitter memories" of anti-revolutionary groups in the aftermath of Iran's 1979 Islamic revolution. In the debate with his chief rival Mir Hossein Moussavi, Ahmadinejad accused Rafsanjani and another former president, Mohammad Khatami, of mismanagement, corruption and masterminding a plot against him. The sparring continued as Rafsanjani drafted an open letter to Supreme Leader Ayatollah Khamenei, stating that "millions of people were witness to [Ahmadinejad's] lies and distortions of the truth, which were against religion, law, ethics and fairness and were aimed at the achievements of our Islamic System." Rafsanjani, a powerful cleric who heads the Expediency Council and Assembly of Experts, was president of Iran from 1989 to 1997. He ran again in 2005, positioning himself in the political center, but lost to Ahmadinejad, then the ultra-conservative mayor of Tehran. In his letter Tuesday, published by the Iranian Labor News Agency, Rafsanjani urged Khamenei to take control and "put out this fire" in the interest of national strength and unity. It is rare for Iran's political leaders to publicly attack each other. Moussavi's supporters organized a human chain stretching north to south through the capital city. When one of Ahmadinejad's supporters strayed into an opposition stronghold, the mood was raucous but not violent as the two camps tried to drown each other out.